Objective: Single-incision laparoscopic surgery (SILS) is rapidly emerging in the field of minimally invasive colon and rectal surgery. We present the feasibility and safety of single-incision laparoscopic right hemicolectomy (SILS-RH) with a modified technique using the SILSTM Multiple Instrument Access Port (Covidien, Mansfield, MA). 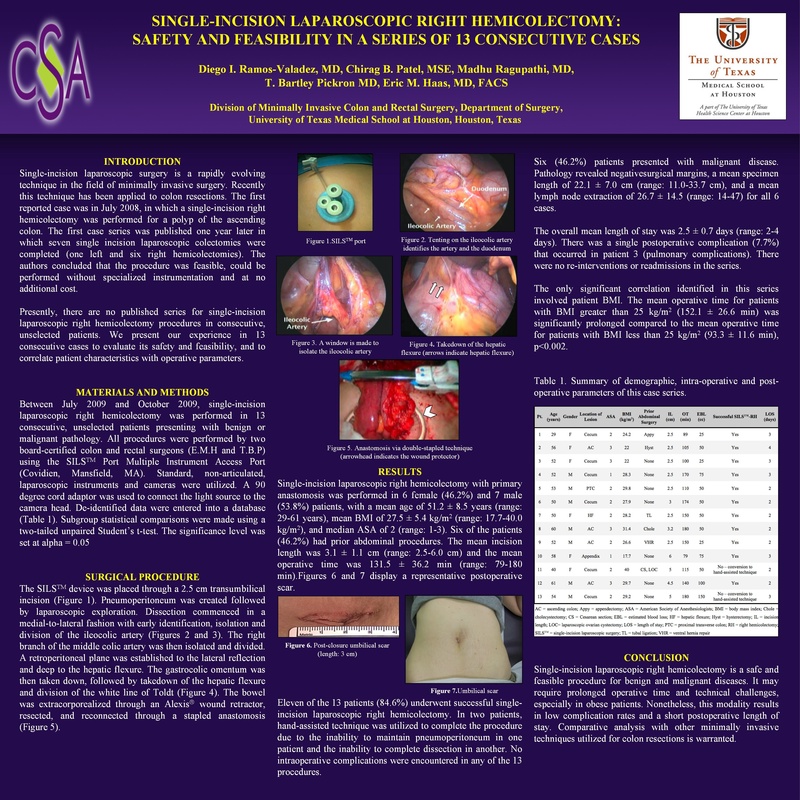 Methods and Procedure: Between July 2009 and October 2009, single-incision laparoscopic right hemicolectomy was attempted in 10 consecutive patients. For all procedures, the port was placed through a transumbilical incision and standard laparoscopic non-articulated instruments were utilized. In all but 2 cases (20%), a medial-to-lateral approach was performed and the ileocolic artery was divided intracorporeally followed by complete mobilization. In all cases, the ileocolic anastomosis was performed following extracorporealization. Data were entered into a de-identified prospective database. Demographic data (patient age, gender, body mass index (BMI), American Society of Anesthesiologists (ASA) score, and prior abdominal procedures) were tabulated. Intraoperative parameters (umbilical incision length (IL), operative time (OT), estimated blood loss (EBL), and intraoperative complications) were analyzed. Additionally, pathology (specimen length (SL) and lymph node extraction (LNE)) as well as postoperative outcomes (length of hospital stay (LOS) and complication rate) were assessed. Results: There were 6 female (60%) and 4 male (40%) patients, with mean age of 49.9±9.1 years (range: 29-60 years), mean BMI of 27.2±6.2 kg/m2 (range: 17.7-40.0 kg/m2), and median ASA of 2 (range: 1-3). Half of the patients had prior abdominal procedures. Of the 10 patients, 9 (90%) underwent successful SILS procedure with mean incision length of 3.1±1.2 cm (range: 2.5-6.0 cm) and mean OT of 133.5±39.4 min (range: 79-180 min). The incision length was less than 3.5 cm in all cases except one, which required extension to 6.0 cm for extracorporealization of a bulky lesion. One patient with BMI of 40.0 required conversion to hand-assisted technique (IL=5.0 cm, OT=115 min) secondary to technical constraints. Pathology revealed 4 patients with adenocarcinoma and the rest with benign disease. All surgical margins were negative, mean LNE was 22.8±12.8 (range: 14-47), and mean SL was 22.4±8.0 cm (range: 11-33.7 cm). The mean LOS was 2.7±0.7 days (range: 2-4 days). One patient (10%) with known pulmonary metastases who underwent palliative resection developed pulmonary complications. The mean OT for patients with BMI greater than 25 kg/m2 (149.8±30.7 min) was significantly greater compared to the mean OT for patients with BMI less than 25 kg/m2 (93.3±11.6), p<0.005. Conclusion: Single-incision laparoscopic right hemicolectomy is a safe and feasible procedure resulting in a small umbilical scar and short postoperative length of stay. It can be performed with conventional laparoscopic instruments and in those cases in which anatomy is not favorable, the procedure can be salvaged with conventional laparoscopic or hand-assisted approaches.